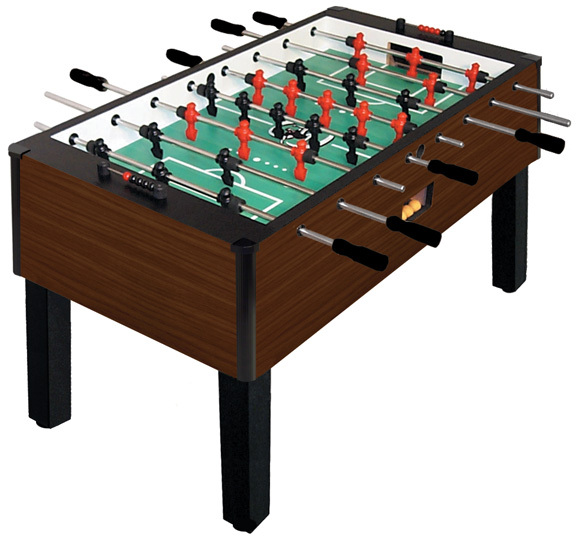 Next time you have the chance, ask a Québécois(e) to tell you the name of the popular game pictured to the left in this post. 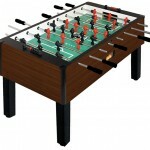 I’m not sure why I expected the French word for “foosball” to make sense. The English word is confusing to me as well. 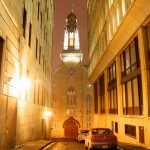 Posted on 2011 December 19 2011 December 17 Tags Culture, French, WeirdLeave a comment on Ask a Québécois(e)! Well what do you know? I have to write a French version of my abstract for my thesis. This means it’s time to go out and buy some Newcastle beers. I have a friend who’s a translator who enjoys Newcastle beer, and if I’m going to exploit my relationship with her for my personal gain, I might as well make it worth her while. Bonhomme Bonhomme, qu'est-ce que tu fais? 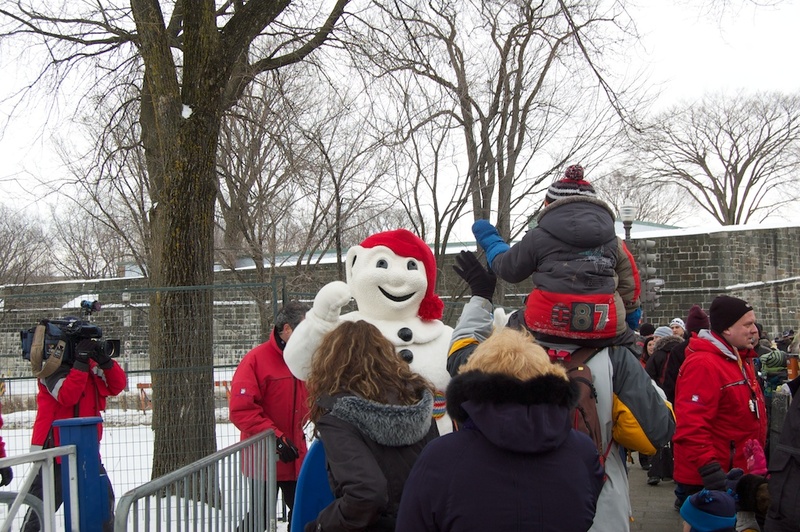 Do you remember learning about the Carnaval de Québec in French class? There’s a particular song that they used to teach us during the unit on the Carnaval. It’s Bonhomme’s theme song, I guess. When I went to Québec this winter, there was a marching band that followed Bonhomme around playing it. Turns out, according to a native French-speaker, that is not only incorrect, but also very creepy. That it was creepy was not at all surprising. I mean, look at him. And I suppose, given the state of French instruction in Ontario, it shouldn’t be too surprising that I got it wrong. In related news, my cellphone ringtone is now the theme song to Téléfrançais. 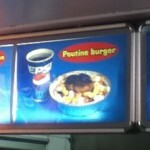 Québec is full of wonderful poutine restaurants. Chez Ben is a restaurant in Granby that sells pretty good poutine, and really small hamburgers. 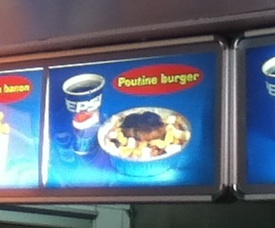 I was very strongly tempted to order the “poutine burger.” And yes, a “poutine burger” is exactly what it appears in the photograph to be: A big aluminium foil pie-plate full of poutine, with a hamburger patty on it. In the attached video, please note that the big giant figure of “Ben” moves, demonstrating that he is stuffing his “bedaine” in front of the restaurant. By the way, if you take my idea and make a million dollars off it, by reading this sentence, you agree, in a legally-binding sense, to give me the trifling cut of only 40% of the profits. I’m pretty sure that’s how this works. I saw it on the internet once. Here’s my idea. I have some candles in my apartment. Smelly candles. Some are supposed to smell like fruits, some like gingerbread. When the candles are burning, they smell wonderful. This is good. The problem comes when I blow the candles out. Every smelly candle does this: When you blow it out, it smells like smoke and something burning, and all the benefit of having lit a smelly candle in the first place is gone forever. This is bad. Here is my proposed solution. Someone should invent a smelly candle that doesn’t stink when you blow it out. You could do this through the use of … umm … chemistry. Or maybe some sort of apparatus that contains the smoke and releases it slowly over several hours, so that I don’t notice it until it’s already over. At least there wouldn’t be the swift and dramatic difference between everything smelling good, and then all of a sudden, smoke and burning things. Maybe I just need to get an airtight jar made of a strong kind of glass whose top I can close when I want to extinguish the candle. I imagine that there would be complications because the air would all be burned up inside the glass, but we can let the engineers solve that one. 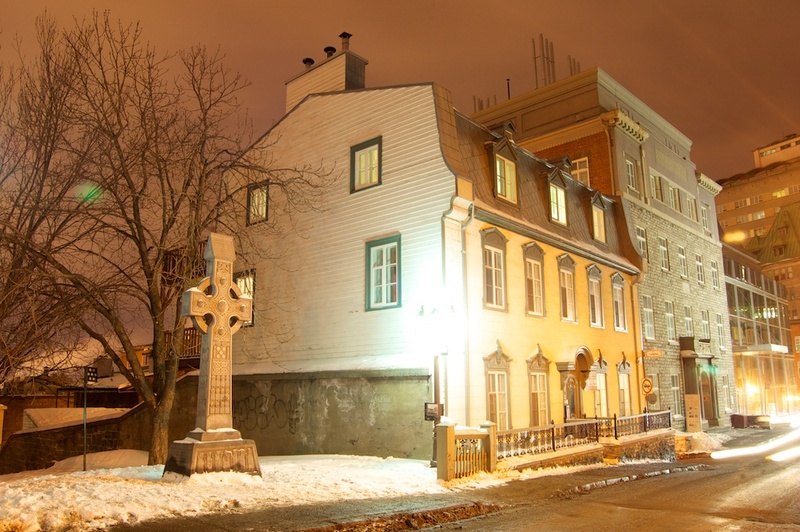 While I mainly went to see the Carnaval, I also went for a walk around the Old Québec a bit while I was in town. It’s a very beautiful city. There are all sorts of wonderful old buildings, churches and historical-type things going on. Not only that, but they have excellent lighting at night, so it makes for some good photos! You just have to be willing to wait for an opportune moment, when there isn’t a car going past, who will leave streaks of light all through your exposure. Thank goodness for digital cameras. 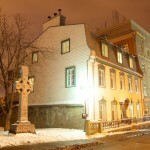 I think I must have spent about fifteen minutes trying to get this photo of the celtic-looking cross. I’ve got a whole bunch of photos of it with streaks across it, thanks to cars. After three or four tries, I was almost prepared to set the self-timer and go stand in the middle of the road, just out of the frame of the camera, so that I would prevent any cars from passing through it. I only wanted a twenty-second exposure, and there was only one car every minute or so. I like the details on the cross, and I think it was worth the wait. 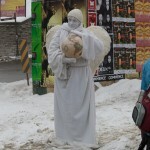 Next is an angel with a globe. I’m not sure what his deal is. I guess he’s like a busker, except that he doesn’t really perform a musical instrument. Not a bad job, I guess. Unless you don’t like the cold. It wasn’t too bad while I was there, anyway. It was consistently around -1ºC or -2ºC, and in the sunlight, during the day, that’s not too bad. 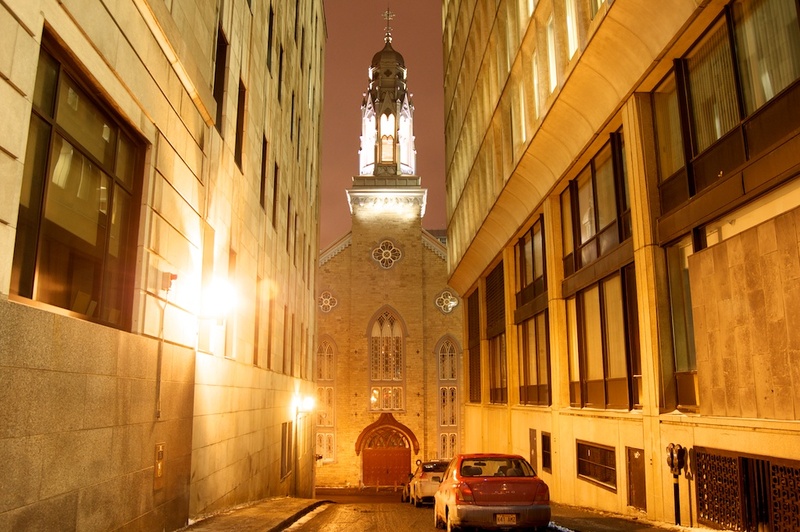 While I was in Québec City, my path crossed two important people. 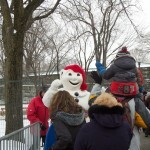 The first and most important was of course Bonhomme de Neige himself. I nearly missed him, but I happened to arrive just as he was leaving, so that I could snap about a dozen shots of him, paparazzi-style. 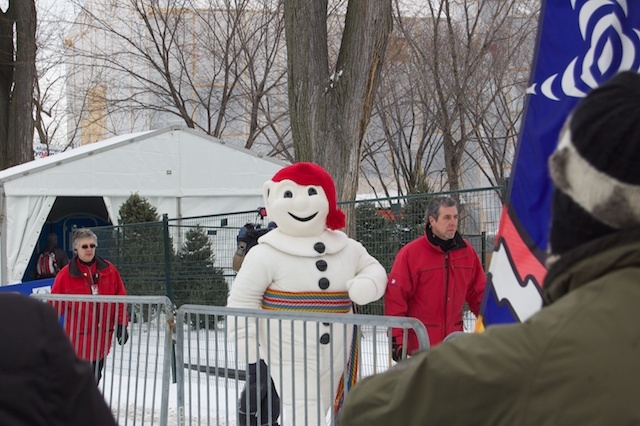 Later that day, while I was walking along a road between the Plains of Abraham and the Carnaval, I saw a big SUV drive past me, and I noticed that it had a blue flag with a royal symbol on it. I remarked that I thought that it was a royal standard on the car that passed, but my friend told me that we would have heard if the Queen was coming. After the first car came a couple other RCMP cars. 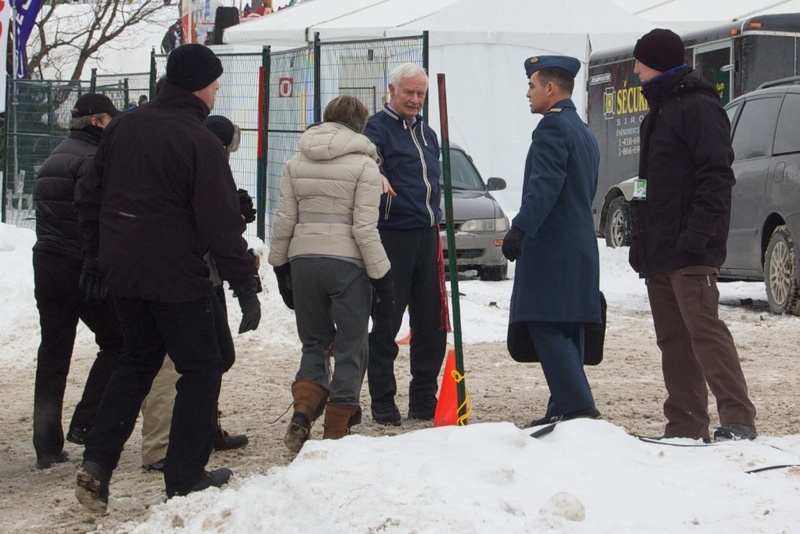 When the car stopped, out jumped David Johnston, the Governor General of Canada. 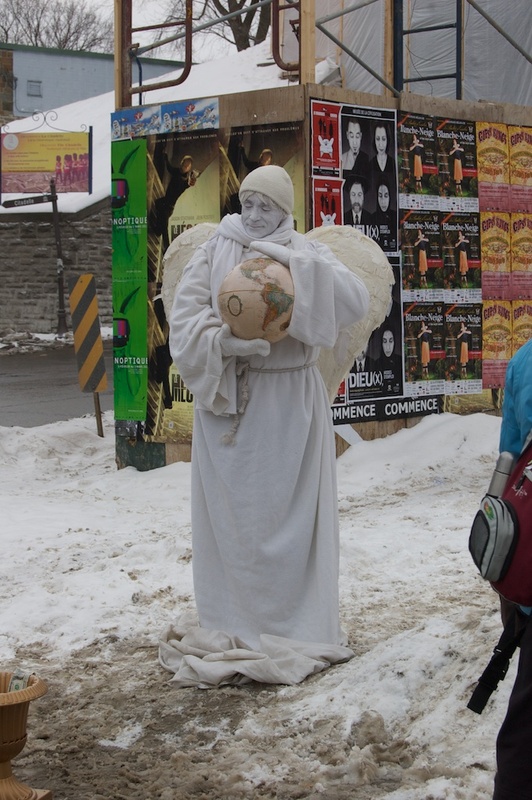 Apparently he had come to visit Québec City. And he passed within two metres of me! So, I ran up and took a half dozen photos of him, paparazzi-style, since that seemed to be the thing to do that day.